A medieval warrior with trusted animal companions, a horse and falcon, decorates the scabbard of the Bronze Falcon Dagger. The bird of prey lands on its masters outstretched hand in a scene reminiscent of folktales and historical lore. Vinery and an antique bronze finish contribute to the rustic appeal of the cast metal scabbard. 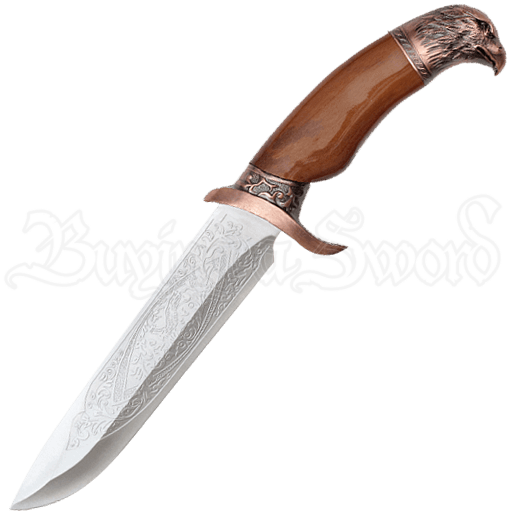 The engraving found on the stainless steel blade of the dagger echoes the same theme. Bronze detail accents the guard and pommel of the brown acrylic handle. A highly detailed cast of a falcon head forms the pommel.